Here is a list of bars gymnastics skills. It’s not a comprehensive list. 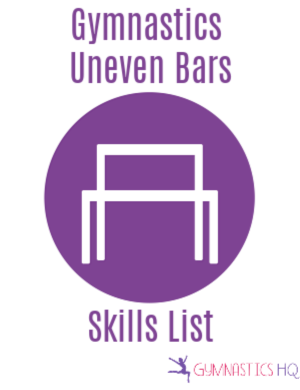 But I’ve tried to list the most commonly learned bar skills in the order that most gymnasts learn them. I hope this is a good starting point for you. Here are gymnastics skills lists for Floor and Beam. My daughter is struggling to catch top bar everytime she catches it she slips off any tips?? I am an eleven year old gymnast. I am in 8th level and I had the same problem as your daughter. For starters, has she tried using grounded up chalk? All you need is a little bit of it and it works great. The only problem with that is it will stain your bars and be scratchy but you can wash it off with a washcloth occasionally. The only other thing I can think of is using bar grips for her hands. I use them often but they do create blisters if on too long. I wis I could do that stuff! I love gymnastics so much an can do a lot of these things any idea what level I am?